You’re reading 7 Ideas To Nurture The Creativity Of Your Child, originally posted on Pick the Brain | Motivation and Self Improvement. If you’re enjoying this, please visit our site for more inspirational articles. In today’s competitive world, all-rounders are stealing the show. As a parent, it is one of your prime duties to make sure that your child is undergoing holistic development and is not restricted to bookish knowledge alone. Developing their confidence and creativity has become as important as studying books. 1. Conventional Toys – Playing is the most important activity from a child’s point of view. Playing, questions their mind and motivates them to ask more questions. According to child psychology experts, a lot of toys available in the market today lay out a well-documented path in front of the child to follow rather than allowing them to explore the different possibilities and find their path themselves. Conventional toys like blocks, balls, clay, and crayons give the child an opportunity to explore stuff whereas contemporary gadgets and electronic toys tell children exactly what the next step is, what is to be done and what button to press to achieve some predetermined result. As easy and modern as it seems, it kills the thought process of the child. So, rather than spending huge sums on modern gadgets disguised as toys, let the child play in the lap of nature and find ways to get themselves involved in things. It must be celebrated and grasped naturally. Try covering the walls of your child’s room with art and other symbols of creativity. All such activities will shape his thoughts and channelize them towards the creative aspect of stuff. 3. The Right Incentives – A lot of parents have the habit of rewarding their child every time they achieve something. Although it will help to motivate the child to perform, such material incentives are known to interfere with the creative thought process of the child, reduce the quality of their responses and the flexibility of their thought. Rather than trying to motivate children with rewards and incentives, allow them to develop master creative activities that they are naturally motivated to do. Give them the right incentives in the form of some words of encouragement, a pat on the back and a tight hug. 4. Give Them The Freedom To Explore Stuff – Keeping unnecessary checks on the children can prove fatal for their creativity. You need to give your child a certain level of freedom so that their brain develops and becomes conscious. Keeping them under constant care will not let them grow into responsible adults. External constraints of the sort of making them color within the lines, speaking within limits can reduce flexibility in thinking and kill their power to make rational choices. Let them perform some safe science experiments to know how things work. 5. 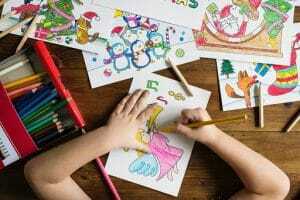 Limit The Screen Time – The lifestyle of the family also determines how creative the children grow up to be. Limiting the time spent with electronic gadgets such as laptops and televisions can make room for creative activities like rehearsing music, learning to dance, playing outside, drawing, reading comics and storybooks, thus enhancing the creative power. 6. Answer Their Questions – The mind of a child absorbs everything like a sponge. Often, children have this habit of asking questions again and again. As difficult and irritating as it gets sometimes, you should not only try answering all the questions of your child to the best of their satisfaction but also encourage them to ask you more, thus making sure that your child keeps taking healthy observations of their surroundings and develops a sound thinking power. 7. Outdoor Activities – Nature has a lot to offer when it comes to developing the creative side of a child. It is dynamic, ever-changing and provides a plethora of opportunities for the child to develop creativity and problem-solving. It inspires the child to think, cross-question, assume stuff, investigate, and develop an innovative brain. Kids can draw in the sand, collect pebbles of different shades, build forts with branches. Thus, these were some of the ideas nurture the creativity of your child. Apart from that, practical stuff like actually performing science experiments, handling sensitive laboratory pieces of equipment like glass bottles, have replaced theoretical knowledge. All these changes in the parenting and educational matters of the children will shape them up into well-groomed all-rounder adults. Ross is a blogger who loves to write especially in the Gifting vertical. he has written many informative Blogs. Currently, he is working with https://www.meddentsafety.com/. he has also written blogs in other verticals too like personal development, unique gifting blogs. His hobby is travelling and exploring unique things. 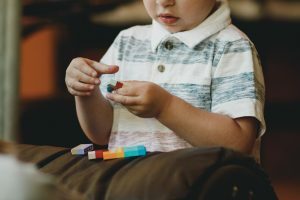 You’ve read 7 Ideas To Nurture The Creativity Of Your Child, originally posted on Pick the Brain | Motivation and Self Improvement. If you’ve enjoyed this, please visit our site for more inspirational articles.